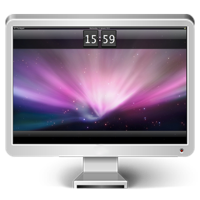 Screensaver + free is an attractive yet practical screensaver app featuring: Sleek Design - Choice of two clock designs: Flip Clock and Traditional Clock - Displays current date and day of the week (Traditional Clock ) - Phone like design Choice of 3 methods to stop/unlock the screensaver 1. Draw your preset Pass Pattern (autohiding interface) 2. Move the mouse 3. Click the stop button at bottom of screen (autohiding interface) Screen saver - Displays dozens of beautiful system images - Allows you to select your own images - Start screensaver (slideshow) manually or set it to start automatically - Selected images are filtered by size to avoid displaying images that are too small Fully functional Status bar - Smart phone like design - Displays Battery level (shows charging when plugged in) - Displays current Wi-fi connection name And many more options - Hide Dock or Status bar icon - Autostart at startup NOTE: This is a fully functional version of the paid Screensaver + app, but this version shows ads after a while. good photos but after paying to upgrade the request to upgrade continues!!! It is good, i like it, especially I can use my beloved families photos as screensaver. I like the fish swimming around behind the document that I am working on. that makes the screen seem further away, and not so miuch in my face. I would like it to have more scenes of fish and not repeat so quickly and have more variety before repeating. Thanks for making this free, it sure is worth trying! I was looking for a screensave of positive qoutes and couldn’t find it until I found this screensaver thank you. Upload your own pictures. this is a wonderful app for your desktop and screeensavers. There are hundreds of catorgories to choose from and hindreds of pics in each catorgorie. i am highy considering getting the pro version. I highly recommendend it!! This is a great screensaver! 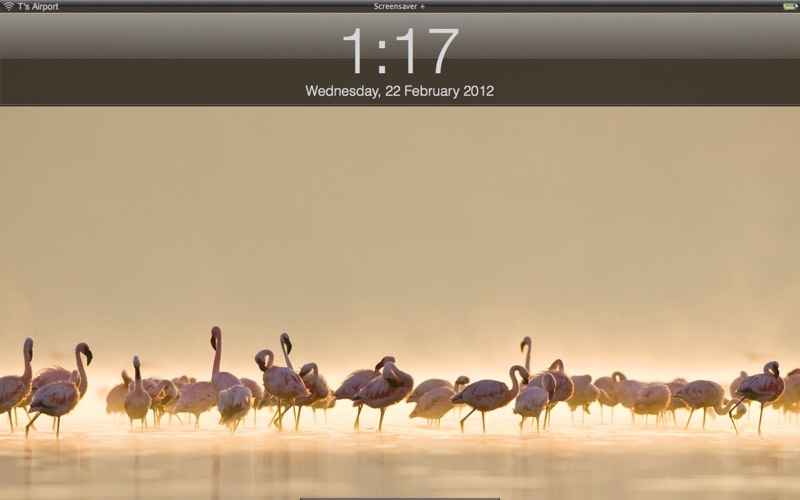 The background is customisable, and there is a pass-pattern to get in just like a iPad or iPhone. The only thing that annoys me is if the 'open at login' button is clicked, a pop-up window opens when you login. Other then that, this app is great! Program is just fine, does what you’d expect. Turnt out to be a good app. Theres an option for extended screens to use the lock screen as well. Some people kinda don't pay attention to things that happen to be something as obvious as that but I'm not complaining. My office gets and got locked before I figured that out.t. I really like this program. For a while, I didn't notice anything wrong with it, until I wanted to change my pass pattern. It turns out, you don't need a password or even the original pass pattern to change the pattern. Therefore, if my computer is not locked, someone can go into my preferences for this program and change my pass pattern, thereby locking me out of my own computer. It's a good prank, but could become very frustrating, especially as I don't know of any backup plan for getting locked out using this program. Maybe a shutdown? Haven't tested it. For the most part, I like this ap. It gives me a sense of security from roommates or co-workers without being Fort Knox. Sometimes it does glitch, though. And that makes me nervous that if it were to glitch, I would be locked out of my own computer. Occasionally I have to unlock my computer 2 or 3 times before it will let me in. But no major problems with it. It would be nice if I could see it without the advertisements. I bought all of them soI wouldn't have to put up with that but I guess there is no way around it. Otherwise they are beautiful pictures. Nice app as far as it goes but it could use a few more configuration options. I would like the ability to move both the clock and the pattern pad to a different location like Upper, Lower, Left, Right, Upper Left, Lower Left, Upper Right, Lower Right, Center. I would also like to make the pattern pad invisible until the mouse is moved or a key is pressed. There is no reason to keep it on the screen blocking part of the images. I should also be able to adjust the opacity of the clock for the same reason -- so as not to cover up parts of the images being displayed. Bug Note: I was never able to get the hot corners to work. I really enjoy the smartphone look that this app gives the Mac. My only complaint is the occasional ad asking you to buy the upgrade to the paid version. Other than that, you'll love it! I was getting bored with some of the desktops and screensavers that I have had on my iMac for several years. I am glad this program came out and have 100's of desktops to choose from. I also like the themes too for holidays and event. I have bought the full version now and have it installed. 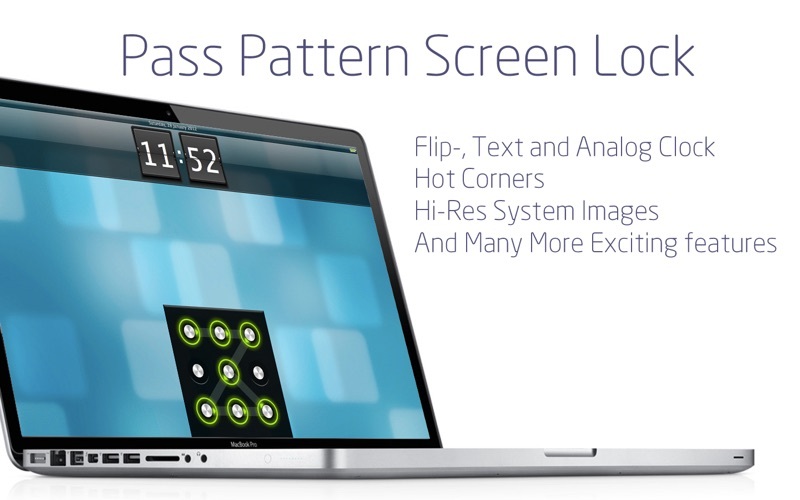 I really like the idea behind this, however, as said before me the ad that pops up does ruin the screensaver aspect. I think it should pop up after you unlock your computer to be less of a nuisance. But the biggest flaw is that it wakes my computer, sometimes at 3am while I'm trying to sleep so I have to get up and shut my computer off again. MBP's wouldn't have this problem, but since I have an iMac this is a huge flaw. I would like to write it off as this being the free version and that you get what you pay for, but I would be upset if I paid for the full version and it did the same thing. Hopefully this bug gets fixed. By far my biggest complaint about this software is the lack of user control. • You can't control the timing of 'fade duration', • You can't choose various types of image transitions. There's only a quick fade transition. • You can't control 'zoom' how close or far away you want your wallpaper pics to appear (it would be esp. useful for people who have watermarked wallpapers). • You can't control how the transparency of the clock "bar". • You can't play video as a background wallpaper. Only images. • You can't hide the cursor even when it's not moving to unlock the screen There's other things that really bother me about this too. It's nice that they offer a trial version though... but include the things mentioned above and after that I'll be more than happy to purchase this. Until then, the developers have some work to do in my opinion. While this program has some nice pictures, it also has an ad screen encouraging the purchase of the full version. It pops up frequently when the screen saver kicks in. The pictures change, but the ad box stays firmly anchored to the spot where it pops up, totally destroying the whole point of the screen saver. Also, it has a bar at the top that includes digital time, which is the only thing about the bar that changes. These two fixed-in-stone-location features make this a revolving picture program, NOT a screen saver. It got removed from my computer within a couple of days. I opened it and didnt really like it. I thought it was something totally different. But i guess not. I was/am trying to get rid of it off my dock and off the top bar thing but it won't leave! It is just taking up space and it is frusturating me. Other than thst the pictures are ok.? I can't see that this app does anything at all other than sit on my dock. Delete. This app is really cool, it adds a different type of security. The app itself works really well and the amount of customization is really cool. The only thing that i would change was actually stated in another review. I think it would be really cool if we could use the multitouch trackpad to unlock the dot lock rather then click and drag. It would be alot quicker aswell as add a little bit of stealth when it comes to concealing what the password actually is. Thats my only request. Please consider it. I love this app. It's great if you want extra security if you change the stop settings. It's awsome. I love this app! 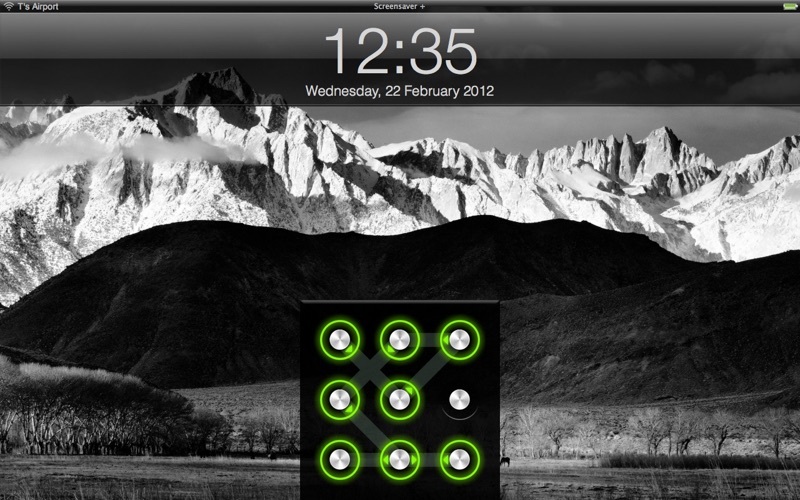 It looks just like an iOS lock screen! I really like it for its simplicity, and, with the draw pass pattern, security. I changed the background image to a water droplets image to make it look just like an iOS. Great job, developers! Good program, love it. I recomend it. I think it would be cooler if we could use these multitouch trackpads for the pattern lock, like just swiping your finger over it like you would a touchscreen instead of holding down the mouse button too. Has a lot of great features, but the clock needs to rotate for me to want to use it as a "screensaver." My understanding is that the clock would burn into the screen since it doesn't move. I love this app, it gives a new way to lock your machine and it works great, but the newest version has a couple things that previous ones didn't have. First, it limits your password to 3 dots, it makes sense since it's the free version but it shouldn't mention it on the unlock screen, it should only say it where you select your pattern. Anyway I understand the limitation and I'm OK with it, but the other thing that came with the update is a REALLY ANNOYING popup that comes every so often asking you to buy the software. The problem is that the computer doesn't need to be locked for that to show up, so you are either watching a video, working or whatever and the popup shows up, I understand they want people to buy the full version, but this is too much, I would say the 3 dot limitation was a good thing to push people to get it. es buena, me gusta pero tiene detalles por corregir, el primero, debería arrancar sola, no tener que activarla o que aparezca en mi barra de aplicaciones, 2 corregir el problema de que a veces se activa y otras no. its a great app, but it really needs a start over button, so if u mess up when drawing ur pattern, you can start over instead of having to continue drawing a random pattern until it says "incorrect passcode". it also should have a confirm button, because that way you have to enter the right passcode to get in. now, if u want to break in to the computer by guessing the code, it will only say that its incorrect when u make the correct number of strokes. that is, if u make a pattern that is one line, its easy to guess because it tells u that its incorrect after the very first line u guess. The reason I do not like this app very much is because when you write the password in, you have to keep clicking the button to go on it. ALso, it would be better if you could just glide your mouse over it so it could unlock. I no you do not need to set a password, but for people that are cautious of getting their stuff stolen, can use one, and it is annyoing to click the password. It would be cool if you could make this work with the caffeine app. its a great concept but I use my computer for studying a lot so being able to turn off the screensaver+free app without quitting it would be nice. Great App! I liked the dot lock feature, but a hide from dock option would give this 5 stars! Great app! Free and effective - what more is there to ask of an app? 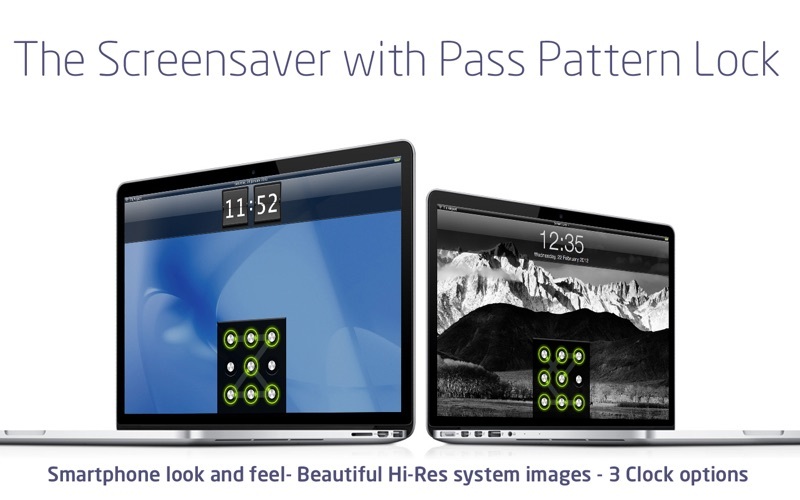 Screensaver + Free is sleak and easy to use. I greatly appreciate the Pass Patern unlock mode and the customizable images. My one complaint would be that even when the app is inactive, it remains in the dock. Could the developers make a patch so that it appears only in menubar. If they did that, I would gladly up my rating to five stars. Overall, wonderfully put together. this app is soo cool i like it alot and it's FREE!! My only wish is that the name will either change or not appear at the top of the screensaver. The screensaver is professional in appearance besides the "Screensaver + free" that appears at the top of the screen while the screensaver is on. It detracts a lot from the professionalism of the screensaver. Besides the frequent requests to buy the full version, this is the best screensaver I have found. As well, the user interface is wonderful, easy to understand, and self-explained very well. I will uninstall it. It seems that there is nothing new or different than the osx screen saver except that it forces me to make a couple more clicks each time it is activated. The popup ad to "buy it now" is very annoying. Seems that all thses apps are doing this. Oh, and why isn't there a "Remove it now" to click on and there should be an option for this here in the App Store.